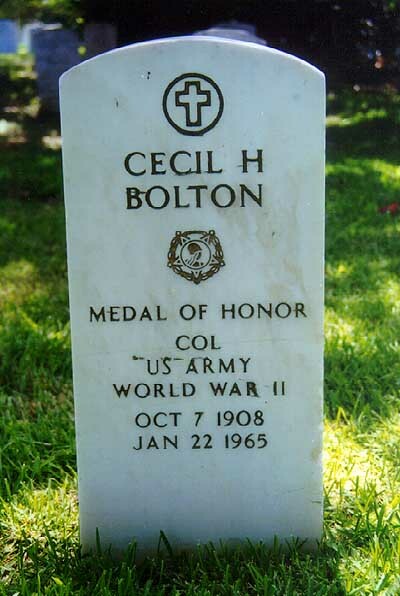 Cecil H. Bolton joined the Army from Huntsville, Alabama in July 1942, and by November 2, 1944 was serving as a first lieutenant in Company E, 413th Infantry Regiment, 104th Infantry Division. As leader of the weapons platoon of Company E on the night of 2 November 1944, First Lieutenant Bolton fought gallantly in a pitched battle which followed the crossing of the Mark River in Holland. When two machineguns pinned down his company, he tried to eliminate, with mortar fire, their grazing fire which was inflicting serious casualties and preventing the company's advance from an area rocked by artillery shelling. In the moonlight it was impossible for him to locate accurately the enemy's camouflaged positions; but he continued to direct fire until wounded severely in the legs and rendered unconscious by a German shell. When he recovered consciousness he instructed his unit and then crawled to the forward rifle platoon positions. Taking a two-man bazooka team on his voluntary mission, he advanced chest deep in chilling water along a canal toward one enemy machinegun. While the bazooka team covered him, he approached alone to within 15 yards of the hostile emplacement in a house. He charged the remaining distance and killed the two gunners with hand grenades. Returning to his men he led them through intense fire over open ground to assault the second German machinegun. An enemy sniper who tried to block the way was dispatched, and the trio pressed on. When discovered by the machinegun crew and subjected to direct fire, First Lieutenant Bolton killed one of the three gunners with carbine fire, and his two comrades shot the others. Continuing to disregard his wounds, he led the bazooka team toward an 88-mm artillery piece which was having telling effect on the American ranks, and approached once more through icy canal water until he could dimly make out the gun's silhouette. Under his fire direction, the two soldiers knocked out the enemy weapon with rockets. On the way back to his own lines he was again wounded. To prevent his men being longer subjected to deadly fire, he refused aid and ordered them back to safety, painfully crawling after them until he reached his lines, where he collapsed. First Lieutenant Bolton's heroic assaults in the face of vicious fire, his inspiring leadership, and continued aggressiveness even through suffering from serious wounds, contributed in large measure to overcoming strong enemy resistance and made it possible for his battalion to reach its objective. 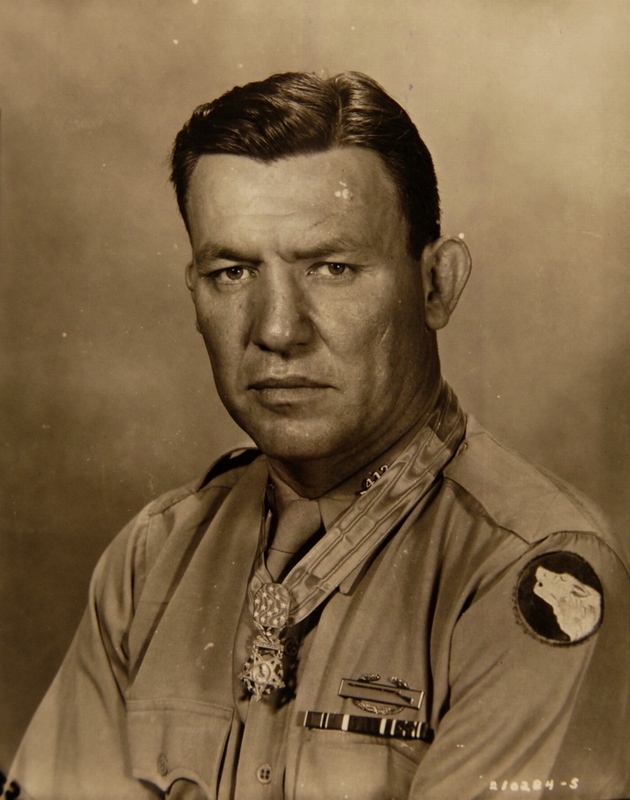 For these actions, at a White House ceremony he was awarded the Medal of Honor ten months later, on September 1, 1945. Bolton reached the rank of colonel before leaving the Army. He died at age 56 and was buried in Fort Sam Houston National Cemetery, San Antonio, Texas.